Those who deal with lubricants, know that car manufacturers approvals are the key selection criteria. 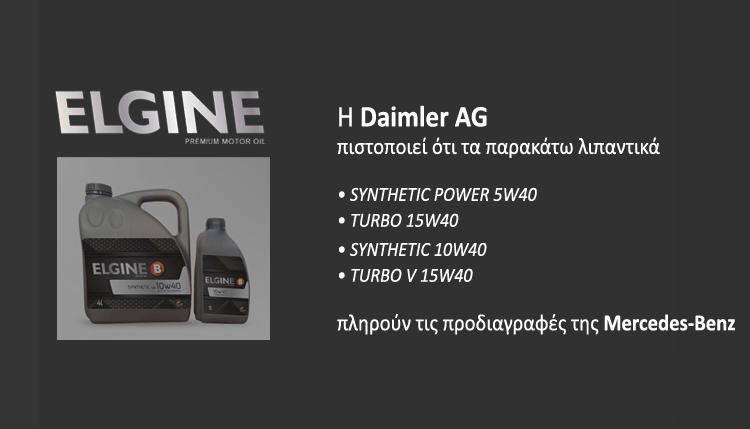 According to the latest tests, engine oils ELGINE Premium Motor Oil SYNTHETIC POWER 5W40, SYNTHETIC 10W40, TURBO 15W40 and TURBO V 15W40 meet the standards of Mercedes-Benz on the basis of approvals from Daimler. ELGINE lubricants cover a wide range of gasoline and diesel engines. This award highlights the continuous commitment of ELIA to provide customers the most reliable, advanced and approved products, together with the competitive price. Apart from the recent certification of Mercedes-Benz, ELGINE lubricants cover a range of specifications from other manufacturers such as Volkswagen, BMW, Ford, PSA, Porsche, GM, MAN etc. and of course they meet the required API & ACEA specifications. Approvals provide security for the suitability of the lubricant in the vehicle. ELGINE lubricants have a comprehensive guide of applications and full support in choosing the right lubricant.